Artifactory is a Repository Manager that functions as a single access point organizing all of your binary resources including proprietary libraries, remote artifacts and other 3rd party resources. This white paper describes how Artifactory addresses the above issues and more, boosting your organization’s productivity by removing much of the overhead connected to the complexity of developing with Java and open source libraries. As Java developers, external repositories are invaluable resources that you need on a regular basis. But what do you do if a repository goes down or if there is an issue with the network. A remote repository serves as a caching proxy for a repository managed at a remote site such as Maven Central. Artifacts are stored and updated in remote repositories according to various configuration parameters that control the caching and proxying behavior. Since much of your code is likely to be assembled rather than built, you want to make sure that your usage of artifacts downloaded from external resources is optimized. It makes no sense for two (or two hundred) developers using the same artifact to download it separately. In addition to reliability, another benefit of remote repositories is reduced networking. Once an artifact has been downloaded, it is then locally available to all other developers in the organization (thus reducing network traffic) . Naturally, this is all transparent to the individual developer. Once artifacts are accessed through Artifactory, the developer can get on with what she does best and leave the binary management to Artifactory. If we look at network traffic from the point of view of a build server, the benefits are clear. A typical project may depend on tens if not hundreds of artifacts from external resources. For the server to build these projects, all remote artifacts must be available to the server environment. Downloading all those required artifacts may generate Gigabytes of data traffic on the network which takes a significant amount of time delaying the build process. By caching remote artifacts locally, the build process is much quicker and incurs much less networking. As Docker technology continues to evolve, its usage continues to grow. If you are not yet using Docker in your organization, it is likely you will do so soon. So now, in addition to managing JAR fiels, you also need to manage Docker images. But there’s no need to onboard and maintain another tool. Artifactory is a fully-fledged Docker repository supporting all Docker Registry APIs. This allows the Docker client to work with Artifactory directly, presenting several benefits for enterprise Docker users. Whether you’re already on board with Docker or just evaluating how to introduce it to your organization, once you’re using Artifactory to manage your JAR files, you’re already covered for Docker images. As a first line of defense, Artifactory supports virtual repositories. By going through virtual repositories you can ensure that your developers only access reliable 3rd party resources that have been approved. For more fine-grained access control, Artifactory lets you use naming patterns with wildcard characters to define “Excludes” or “Includes” for download. With this flexible mechanism you can define anything from a whole repository to be excluded from your organization’s access, to including a single artifact within a repository which may be critical for your development efforts. Once you have decided what can be downloaded to your servers, you can then define which users or groups of users can access it with a full set of permissions you can configure. In addition to controlling download of artifacts, you can use permissions for complete access management of artifacts. You can control where developers can deploy artifacts to, whether they can annotate metadata, whether they can delete artifacts and more, And if it’s access to your servers that you’re concerned about, Artifactory provides full integration with the most common access protocols such as LDAP, SAML, Crowd and others. The All rights reserved. 2014 © JFrog Ltd. March 2014 | JFrog Ltd. | www.jfrog.com 8 comprehensive security and access control capabilities in Artifactory help you manage your development process by ensuring that developers can only access repositories for which they are authorized to. For example you can ensure that developers can deploy release targets to a QA repository, but only authorized QA staff, who have ensured that a release candidate has met the required standard, can promote it to the “releases” repository. User plugins give you a simple way to implement complex, custom behavior by extending the functionality of Artifactory. This infrastructure presents a long list of entry points which effectively extends the Artifactory REST API . This gives you enormous freedom to implement virtually any custom behavior in your binary management workflow. This includes scheduling tasks, managing security and authentication, license compliance and open source governance, artifact resolution and deployment, build integration and promotion logic, maintenance and cleanup and more. To keep things simple, user plugins are written as Groovy scripts and have a simple DSL to wrap them as closures within the extension points. The plugins can be changed and redeployed on-the-fly, and can even be debugged – all from within your favorite IDE. Artifactory can help prevent such a scenario. Upon deployment of any binary to your repositories Artifactory performs a license check on your artifact and on all ensuing dependencies, and provides immediate feedback on all license requirements. This lets you prepare ahead of time to ensure you comply early on in the development cycle avoiding unnecessary delays at “crunch time” when you want to release. And by integrating with Black Duck Code Center, you can take advantage of a full range of license compliance and open source governance features while managing all of your binary uploads through Artifactory. Systems that are considered mission-critical to an organization can be deployed in a High Availability configuration to increase stability and reliability. This is done by replicating nodes in the system and deploying them as a redundant cluster to remove the complete reliability on any single node. In a High Availability configuration there is no single-point-of- failure. If any specific node goes down the system continues to operate seamlessly and transparently to its users through the remaining, redundant nodes with no down time or degradation of performance of the system as a whole. As already mentioned, most of your product is likely to be assembled from components, however you still want to make the most of your proprietary code. If you create a binary, you want to be able to easily share it with other developers in your team and across your organization. Using local repositories, Artifactory gives you a central location to store your internal binaries. When all teams know that any artifact can be accessed by its GAV coordinates from a single URL, access to local artifacts and managing dependencies between the different teams becomes very easy. But what if you want to share your binaries with colleagues who are in geographically remote sites of your organization. With current use of build servers and CI systems, the number of artifacts you generate can grow very quickly. Without proper management, your systems can quickly get clogged with old and irrelevant artifacts. Artifactory keeps your system organized and free of clutter with automatic, timed cleanup processes. With a few simple settings, you can schedule tasks to clean up old builds and unused artifacts. You can set restrictions on and monitor disk space usage or define “watches” to receive an alert whenever there is a change to your most critical binaries. And with an extensive REST API, Artifactory can support virtually any rule-based cleanup protocol you would want to implement in your organization’s scripts. 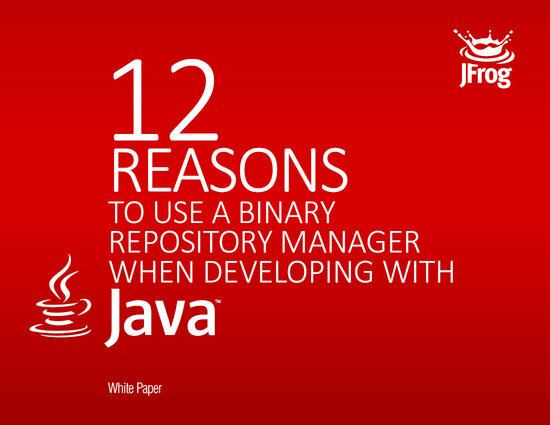 This paper has shown how a Binary Repository Manager such as Artifactory can boost productivity of your organization’s Java development teams by managing and optimizing access to binary artifacts, integrating with build systems and facilitating open source governance. Since Artifactory is agnostic to the binary types that it manages, it can work with Linux packages, RubyGems, NuGet Gallery and virtually any third party repository to support the different platforms used by your organization, and provide central control over all binaries, both when uploading builds and when downloading artifacts.